One phase of life comes to an end on Friday for 47 Railroaders at the same time another phase begins. Whitehall High School will host its 2018 graduation ceremony at 7 p.m. in the high school auditorium. However, school officials did want to make it clear that no one will be admitted prior to 6:30 p.m. as staff will still be setting the stage at that point. “They have been great; they’ve been strong both athletically and academically,” said high school principal Jeff Keller, who noted that the averages of the Top Ten students are separated by only fractions of points. The graduates’ plans are as varied as their personalities. The majority will be attending college while others will be enlisting in the military and yet others will be enrolling in trade schools. Last year the Top Ten was evenly divided among boys and girls. It is a different story this year, with the girls dominating the Top Ten, claiming seven of the top spots. James Rozell is valedictorian and Kaylyn Rehm is salutatorian. The remaining Top Ten are, in order, Makayla Wells, Chloe Harris, Courtney Wiskoski, Hannah Bascue, Shane Amerio, Evan St. Claire, Jessica Bruce and Tressa Clemons. 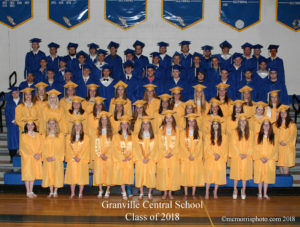 Seventy-five young men and women will walk across the stage tomorrow, ending their days as students of Granville High School. The school’s 132nd annual commencement ceremony is set for 6:30 p.m. on the front lawn of the high school. If rain is predicted, the ceremony will be moved to the senior high gymnasium. Speakers including Board of Education president Audrey Hicks, superintendent Thomas McGurl and Interim high school principal James Polunci will say a few words before diplomas are awarded. Valedictorian Kyra Gee and salutatorian Elizabeth Hicks will also speak. Seats will be set up on the lawn for parents and the graduates’ other guests with tickets. The rest of the lawn is fair game for family, friends and community members to bring lawn chairs, blankets and more to watch from. “Outside, there’s so much space,” said Laura Colombo, graduation coordinator. This Friday, 28 Hartford seniors will walk across the stage, accept their diplomas and bid farewell to their high school years. 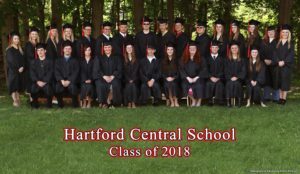 The graduation ceremony, set for June 22 at 7 p.m., will be held in the Hartford Central School gymnasium. The ceremony will feature a number of speeches including those by commencement speaker and school principal Brian George, valedictorian Adam Mitchell and salutatorian Abigail Robbins. All graduates will participate in singing a senior song and graduates that are members of the band play a selection with the band. A slideshow presentation featuring photos of each senior and slides from various group activities ranging from elementary school through high school sports, prom and fundraising events will also be shown. The school will mark graduation with a number of traditions. A portion of the ceremony is dedicated to thanking parents for supporting their students throughout their school years. The 43-year-old tradition allows graduates to pay tribute to moms and dads by bringing them roses.